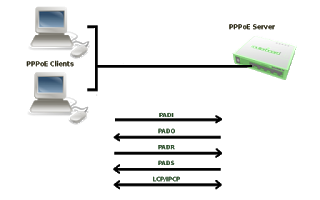 Mikrotik PPPOE is a type of point to point protocol that is deployed over ethernet. It is used mostly by ISPs to provide internet access to their customers. This is so because Point to point Protocol over ethernet (pppoe) provides ISPs with the ability to extensively manage connected users. In this demonstration, I will share with us how to configure a pppoe server and client on a Mikrotik router. Before proceeding with the pppoe configuration, it is expected that your router must have been configured with all requirements needed for internet access. To see how to configure a Mikrotik router for internet access, click here. pool of IPs that will be assigned to connected pppoe clients. Click on IP>>Pool>>add>>enter a name for the pool>>enter the address range for the pool. Alternatively, click on new terminal from the main menu and enter the code below. Make sure to edit the IP address range and pool name to what you would want. Next, you create the pppoe profile: Copy, edit and paste the code below in the new terminal window. Make sure that the interface name entered is the one connecting to the pppoe client and that there is no IP assigned to this interface. If you assign an IP to this interface, clients can easily connect without the need for pppoe authentication. The only IP associated with this interface should be the local address you assigned when creating the profile above. Make sure the password matches the one set on the server and that the chosen interface is the one connecting the client to the pppoe server. If you find it difficult entering the above codes and would prefer the guide from winbox, click here.